The notion of needs was initially developed in the field of psychology by Abraham Maslow to explain individual motivation process (Maslow, 1943). 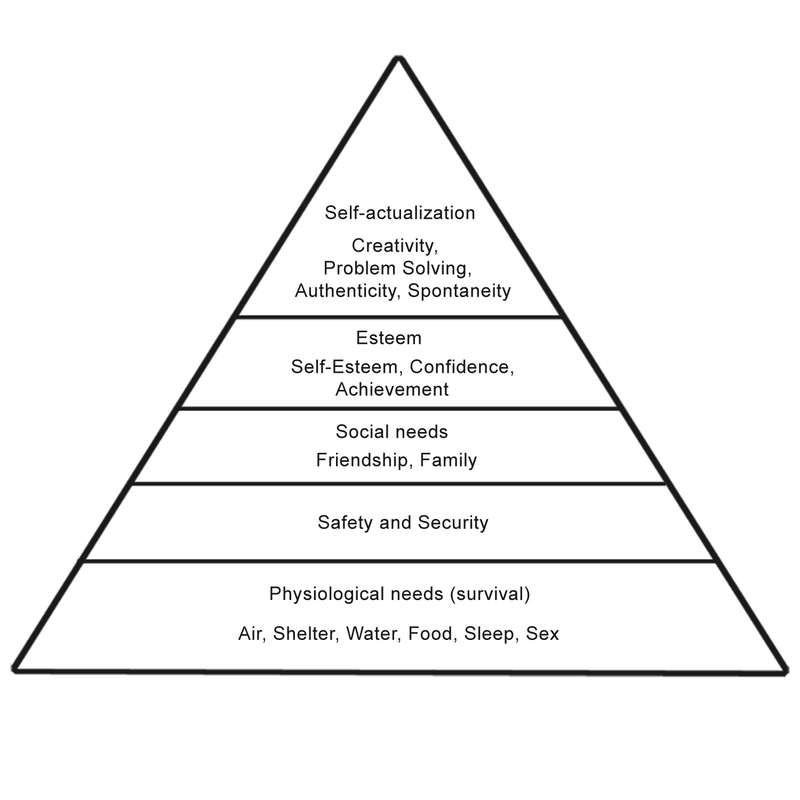 His ‘hierarchy of human needs’ consisted of five needs, ranked in a pyramid (see Figure 1): physiological (hunger, thirst, warmth, sleep, etc. ), safety (protection, order, law, etc. ), belongingness and love (affection, family, etc. ), esteem (competence, approval and recognition), and self-actualisation needs (realising personal potential, self-fulfilment, seeking personal growth and peak experiences). The core principle according to his theory is that an upper need cannot be satisfied until those lower in the hierarchy are met. This hierarchy has been criticised from many angles. For example, individuals can have affection even if their physiological needs are not fully satisfied. Moreover, the model implies that only sufficiently well-off people can achieve self-actualisation, which contradicts the realities of, for example, poor artists who have developed well their individual potential. In the context of environmental protection (which this model regards as a self-actualisation need), the hierarchical assumption has been used to justify the position that poor countries must first meet their basic needs before tackling environmental goals such as mitigating climate change. This kind of reasoning tends to legitimate any kind of economic growth in poor countries, a strategy that is not shared by everyone, especially from a sustainability perspective. The degrowth concept would be an example. In response to the limitations of a Maslow’s hierarchy, Chilean ecological economist Manfred Max-Neef created his model of ‘human scale development’, aiming to build a human needs theory for development. For Max-Neef, ‘fundamental human needs are finite, few and classifiable and are the same in all cultures and in all historical periods. What changes, both over time and through cultures, is the way or the means by which the needs are satisfied’ (Max-Neef, 1991). Nine fundamental needs are identified (see Table 1): subsistence, protection, affection, understanding, participation, leisure, creation, identity and freedom). 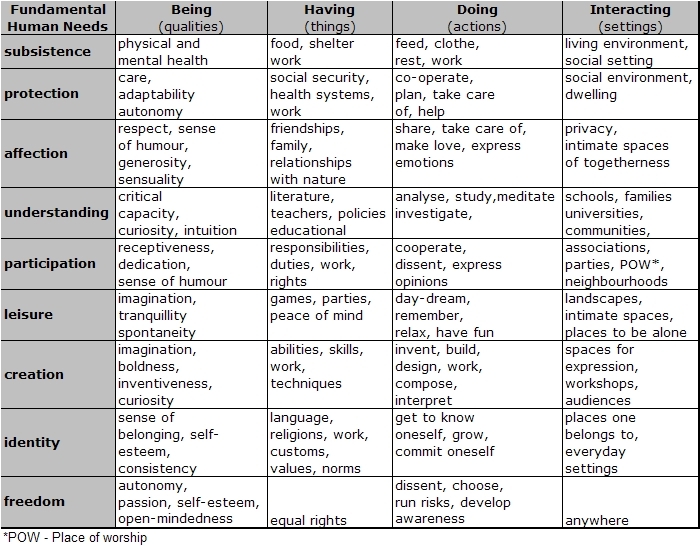 While there is some overlap between Max-Neef and Maslow with regard to the categories of needs (e.g. subsistence resembles physiological needs, protection is similar to safety and affection is related to belongingness), Max-Neef rejects the hierarchical principle and considers that ‘no need is more important per se than any other and there is no fixed order of precedence in the actualisation of needs (that need A, for instance, can only be met after need B has been satisfied)’ (Max-Neef, 1991:49). Max-Neef ’s model is composed of other variables. Firstly, there are four types of satisfiers, i.e. means to meet these needs: being (personal or collective attributes/qualities), having (institutions, norms and material things), doing (personal or collective actions) and interacting (settings). The second variable relates to ‘economic goods’ defined as objects or artefacts affecting the efficiency of a satisfier. With these variables, it is possible to build a matrix of needs and satisfiers to diagnose the level of satisfaction of the nine needs in a specific group or society. The model can also be used to determine the satisfiers required for fulfilment of the needs of this group and, therefore, to conceive a strategy for development aimed at the actualisation of human needs. Some ‘satisfiers’ are synergic: a mother feeding a baby satisfies subsistence, affection, protection and other needs. Other ‘satisfiers’, on the contrary, while satisfying some needs, damage the satisfaction of other needs (Max-Neef, 1991). Doyal and Gough (1991) have also developed a theory of human needs, considering their realisation the precondition of a fulfilled life. In this model, two universal basic needs and 11 intermediate needs are identified. These recent models of needs have implications for well-being theory, at the individual and societal level, and in ecological economics (Jackson and Marks, 1999). Indeed, in Max-Neef’s theory, unsatisfied needs are seen as poverties, broadening the concept of poverty to more than a lack of income and beyond monetary measures. Following this reasoning, development means the alleviation of multiple poverties and becomes the social analogue of individual self-realisation or flourishing, relevant to both North and South (Dodds, 1997). Furthermore, by distinguishing basic needs from economic goods, a needs-based welfare conception puts in question the positive relationship between increased material consumption and increased satisfaction of needs, especially of non-material needs. Therefore, it contradicts the conventional economic approach, which regards needs as subjective desires and preferences that can be satisfied through consumer choices, questioning the primacy and the unidimensional role of economic growth in the improvement of human well-being. In terms of sustainability, this opens the door to arguments that environmental imperatives should not be viewed as constraints on human welfare and that the satisfaction of needs and development do not automatically imply natural resource depletion. Dodds, S. (1997) Towards a ‘science of sustainability‘: Improving the way ecological economics understands well-being. Ecological Economics, 23, 95-111. Doyal, L., Gough, I. (1991) A Theory of Human Needs, Macmillan, London. Jackson, T., Marks, N. (1999) Consumption, sustainable welfare and human needs- with reference to UK expenditure patterns between 1954 and 1994. Ecological Economics, 38 (3) 421-441. Maslow, A. (1943) A Theory of Human Motivation. Psychological Review, 50 (4) 370-96. Max-Neef, M. (1991) Human Scale Development. Apex Press, New York. Thank you for a much need, refreshingly different outlook to the hierarchy oof needs by Maslow. When I first learnt about Maslow’s ‘theory’, it did not sit well with me- having to write on it in 1st year Psychology felt hypocritical. I fully support Max’s theory and suggest it’s time to replace old, forced concepts within our educational system.